The yellow bit in tomatoes. Research at the Rowlett Institute in Aberdeen has proven that tomatoes contain an ingredient that reduces the tendency of the blood to clot, reducing the risk of Thrombosis and Heart Attack. The ingredient, currently undergoing further testing is code-named P3 and is located in the yellow juice around the tomato’s seeds. An initial study has shown that P3, extracted from just four tomatoes, reduced blood platelet activity by up to seventy two percent. P3 has also been found in smaller concentrations in strawberries, grapefruit and melon. P3 works by stopping the blood platelets from binding together, an action that if taking place on a large scale, results in the formation of a sizeable internal blood clot (thrombus). The ultimate danger is that this blood clot could become wedged in a narrowed section of artery, preventing blood flow to the regions beyond it, starving the muscles, or organs of oxygen. If the blood supply to the heart muscle is cut off in this way, a heart attack will result. Regular Mountain Biking, as a form of aerobic exercise, enhances fibrinolysis, a natural blood-thinning process, which coupled with a regular dose of P3 should ensure that you stand a lower than average chance of suffering a heart attack. The recent discovery of P3 in tomatoes isn’t the only reason to eat the wonder fruit. Tomatoes also contain an antioxidant called Lycopene which is known to reduce the risk of breast, prostate and colo-rectal cancer. Some of the latest research on lycopene suggests that it may have the ability to slow the growth of all types of tumours. 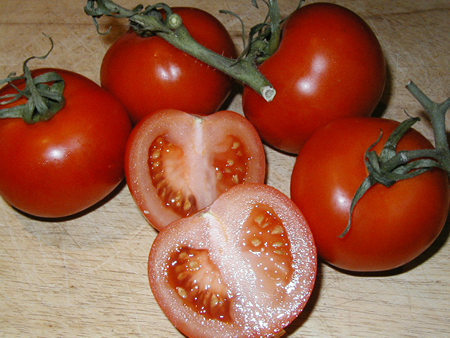 It is rare that one is encouraged to consume processed foods, but concentrated forms of tomatoes are an exception. 100 grams of fresh tomatoes contain 3mg of lycopene, compared with 12mg per 100 grams for tomato ketchup and better still, 15mg per 100 grams for pasta sauce. Unless P3 is lost during processing, it is also likely that larger quantities of this ingredient will be consumed through concentrated than fresh tomatoes. As this situation is unclear at the present time, I recommend that you eat plenty of fresh tomatoes, but don’t let any one tell you that you’re spoiling your food by putting ketchup on it!